I love yard sales when that special something jumps out at you. These crazy birds are great. Here's another tin. I've had this a long time. And here's a little bag that I finished off this morning, inspired by all the Japanese ones I've been seeing. My neighbor gave me this little lamb. I was admiring it on one of my visits. Wasn't that sweet? She's my little knitting mascot. 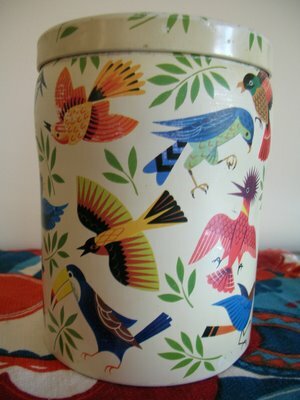 I LOVE the first bird tin-- my budgies would love the second and think someone painted them on a tin! 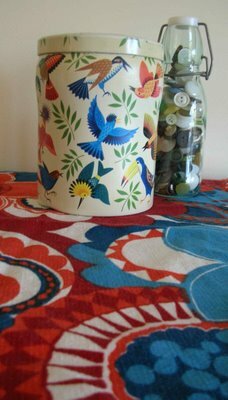 That bird tin is very cute. I also like your little bag! Hi Stitchy - I love the parakeets. I look forward to the day when there are no more cats in our life. I will march right out and get TWO!! 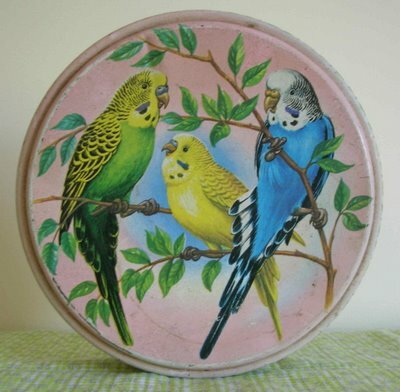 the budgie plate (?) is sooo wonderfull! love it! I like the new tin. 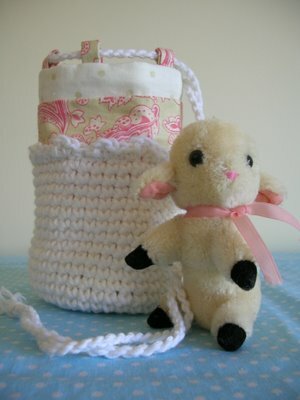 My daughter admires the little lamb and the bag. Has the lamb got a name? Your knitting mascot is adorable! Love your finds! What nice bright colors! Trying to shake it off.